Palmistry, also known as chiromancy, is the art of interpreting lines on the hand to evaluate someone’s character or foretell their future. The history of palm reading is uncertain, but may have originated in India in Hindu astrology, and spread to China, Tibet, Persia, Egypt and Ancient Greece, at least partly through the traditional fortune-telling practices of the Romani people. 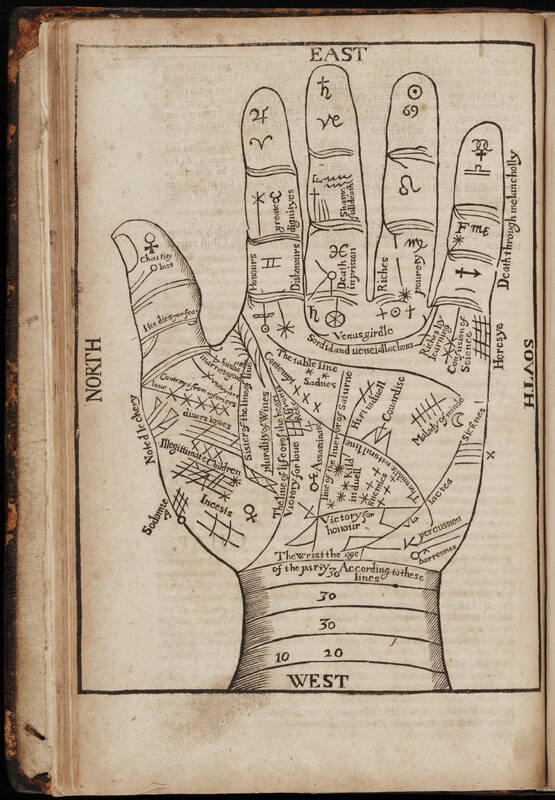 After falling into disrepute due to its associations with magic and witchcraft during the middle ages, interest in palmistry saw a resurgence during the 17th century, when scholars began to attempt to find rational and scientific foundations for the practice. This compelling 17th century woodcut illustration, which maps out the lines of the palm and their meanings, is from Jean Baptiste Belot’s Les Ouevres, published in Rouen around 1640. Belot was a French Renaissance chiromancer, whose studies in palm reading were deeply influenced by physiognomy and astrology, assigning astrological and zodiacal significance to various parts of the hands and fingers. On the opposite part of the palm, there is a mixed bag of possible fates and personality traits inscribed in the lines of the hand: an area for barrenness, malady of mind, sickness, heresy, riches by learning, assassinated, confusion of science, cowardice, victory for honor, killed in duel, hurt in duel, percussion (meaning “a beating” in this instance, rather than a percussive instrument) and death through melancholy. Unfortunately, I am not skilled in the dark arts of chiromancy, so I cannot read my own palm even with the help of this enlightening illustration. Which is a shame, because I would very much like to know my divine chances for surviving a duel, just in case. // Image via Vintage Printable. Click on the image at the top for a closer look. For further reading on the subject of palmistry, you can access the fascinating Chiromancy, or The science of palmistry by Henry Frith and Edward Heron-Allen (1883) for free online, digitized from the University of Oxford libraries. For more images, see this wonderful collection of vintage palm reading charts gathered by Ana Montiel of On The Present Tense. Currently exploring the theme of the Body as a site of meaning. As part of my research adornement through tattoos and the use of organic materials as make up is of interest. This article further explores the ideas of the unseen marking on the body that denote how you may be viewed. When I was only ten, a gypsy fortune teller at the county fair looked at the lines on the side of my pinky finger and declared that I’d have five children. I bolted from that tent, quite concerned for my future. Fortunately, her predication did not come to pass. Thanks for this wonderful post. You’re going to be so shocked when those secret illegitimate quintuplets show up at your door. I would definitely buy those. Too bad my hands are tiny. Interesting. Why is it in English? I’m not sure! When I was researching the image, one source hinted that this particular image could have been taken from a 1649 edition of the book, so I’m wondering if maybe that edition was an English reprint? That is just conjecture though. I gotta say this is my favourite blog out there at the moment!